Home - Demb Flash Products - Diffuser, Flip-it! 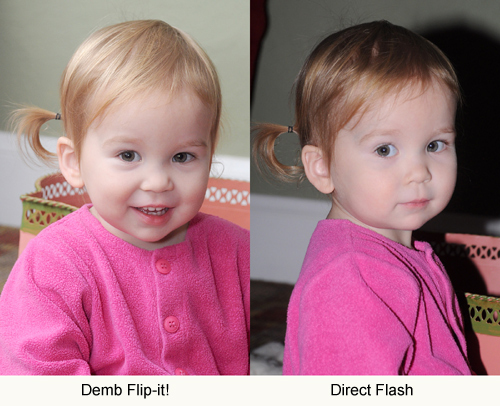 Demb Flash Products: What a Difference! Direct flash makes the little girl’s face look very flat. The shadows are dense and abrupt. The Demb flip-it! makes those problems go away. Let me help you create photographs that look like portraits, not snapshots. Instead of pointing your flash forward, tilt it straight up to the bounce position and rotate it 90 degrees clockwise. The modifier slips on the top of your flash as shown in the illustration. Typical settings for different situations, both indoors and outdoors are shown here. All Demb modifiers work by the same principle. You may choose the size that you feel best fits your camera and flash. Flash Diffuser Pro Diffuser Classic Big Flip-it! Classic Flip-it! Saucer Flip-it! Wedding Pro Saucer Flip-it! Products may also be purchased from in New York. The following products may be purchased through Amazon.com: Classic Flip-it!, Flash Diffuser Pro, Saucer Flip-it! and Wedding Pro Saucer Flip-it!.